Nancy lives in Minnesota with her cat and neurotic dog. When she isn't writing she's gardening in her weed patch, mowing the lawn or shoveling snow. Now retired from a career in trucking, she's finding out there's more to life than pavement and loading docks. There's nowhere she'd rather be than home. This book caught my attention and held it to the end. It takes a hard look at the atrocities of slavery and brings the parallels right into the present day. It brought the horror of the Charleston murders to me in a way that makes it much more than just a segment on the news. This turned out to be a good book, although it took me a while to get into it. It moves along quickly, but I found myself getting a bit lost at times. It is part Starwars, part romance, and part sci-fi. The one thing I didn’t like was the abrupt ending. It seemed like the author just decided to quit writing when there was more story to tell. I usually like cliffhangers, but they have to end in a way that is drawing you into the next book. This one kind of just stops. D. S. Murphy flawlessly blends Mythology and Contemporary Fantasy into a “cant’ put it down” book. Start reading here and you’ll be hooked for the rest of the series and become a D.S. Murphy fan as I have become. Not a bad thing… Mr. Murphy has tons of free giveaways to keep you reading for a long, long time. This book is Quality writing and a great value. Anna’s mom would rather party than parent. A street-savvy teen from New York City, Anna is exiled to live in a nowhere town with her uncle. Feeling alone and rejected, Anna struggles to fit in with small-town kids. A new friend knows how to get things done, and together they tackle high-school head on. Learning how to ride her neighbor’s horse changes everything for Anna, as she discovers a lifestyle that her mother once enjoyed. It also reveals the key to her mom’s sketchy past. I hope you enjoy reading this book as much as I enjoyed writing it. Part of the book is a stroll down memory lane for me. I was lucky enough to grow up in a small town in Minnesota where my family was able to have a few horses. The inspiration for the book came from watching my father shoe horses. The book is really a tribute to him—his saddle is on the back cover. When I was in the seventh grade we moved from big-city, Minneapolis, to small-town Faribault. It was finally a move I could live with. We had moved several times before and it was always traumatic for me. I wasn’t very good at making friends. But this time we would move to a hobby farm (my father was a farm boy) where we could have horses. I remember being filled with hope that this time I would be one of the cool kids. I’m pretty sure I still wasn’t one of the cool kids—but it didn’t matter. I had a whole barnful of horses. (We boarded some for other people.) Dad, being frugal and used to doing things himself, paid for horseshoeing a few times, then he learned how to do it himself. The money-saving trick turned into a pretty steady business and he probably shoed most of the horses in Rice County and beyond for a while. He is definitely one of the cool dads. Trail rides, veterinarians, even the old feed mill all are bits and pieces of my growing up years. Some of the characters in the book are real, and some are made up. Some of them are a blend of several different people (or horses), maybe even a bit of my self is blended in there. Anna’s story isn’t mine. My mom is more like Isabella, staying home and baking cookies. The idea of a kid struggling with a parent’s addiction struggles comes from watching how kids are affected by this epidemic in our society. Not all of them react the way Anna did, but a friend of mine certainly shares many of her attributes. Sometimes I see this friend in Anna and sometimes I see her in CeCe. If you see yourself in this book, maybe we met on a trail ride somewhere. I hope it brings back some of those pleasant memories for you as well. The second book in this series is written but needs much editing. It should be out soon in early 2018. 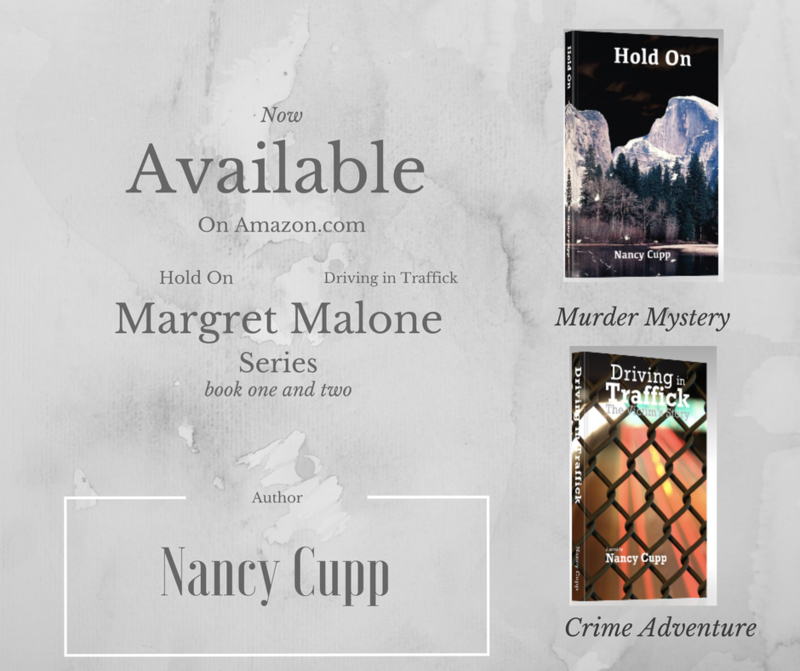 If you would like notification of its release please sign up on my webpage www.nancycupp.wordpress.com or just drop me a note at nancy.aMuse@gmail.com . The recent shooting in Las Vegas has got me, like everyone else, thinking. Of course the events there are horrendous. I don’t think for a moment that anybody thinks it was exciting or cool. Why then, do sales of thriller type novels outpace all others? We all seem to crave the action based books and movies. When is the last time you read a book that didn’t have a gunfight or murder of some kind in it? I have to admit, my first novel is a murder mystery. I didn’t even set out to make it about murder. I just started writing, without much of a plan. When I ran out of plot, I had to make something happen. So I killed off one of the characters. I didn’t try to make it about the murder as much as about the main character’s adventure. But then I got started describing things, one thing leads to another, and there it was. I had written about something awful. I don’t even like that kind of book, but I went ahead and used sensationalism to make my novel work. A friend of mine told me about a great vacation where they had an authentic Wild West adventure. They went on a chuck wagon ride but were ambushed by “bad guys” with guns. There was a shootout and lots of guys “died”. Really? That’s what you want your kids to experience? So is it bad to write about such stuff? Probably not. When we read or watch movies it makes us think. We work out what we think about certain issues. We take sides on legislation. We get insight into what the other side’s point of view is. Hopefully, we make decisions about ways to prevent bad things from happening. What my point is here, I think, is pay attention to what you are consuming. If you have to have a steady diet of violence, you may want to think about what you read and watch. does it make you numb to things like gunfire? Do violent games make kids more prone to violence? I think it does. There have been studies done on that sort of thing. While no, it can’t be proven, I think it has an effect. Do I condone censorship? No. But I think we all have to think about what we use to entertain ourselves. Explore other genres. I’m going to try to make it a point not to write any more murders. Frankly, it creeped me out to know I had the capability to write about it. Especially when I had to get into the mind of the criminal. I kept trying to make him an okay sort of guy. I think we have to be careful when we try to make the criminal a misunderstood victim. Some thrillers have the “good guys” shooting people who needed to be dealt with because they were in the way. Sheesh.